With the assassination of President Abraham Lincoln, the Presidency fell upon an old-fashioned southern Jacksonian Democrat of pronounced states' rights views. Although an honest and honorable man, Andrew Johnson was one of the most unfortunate of Presidents. Arrayed against him were the Radical Republicans in Congress, brilliantly led and ruthless in their tactics. 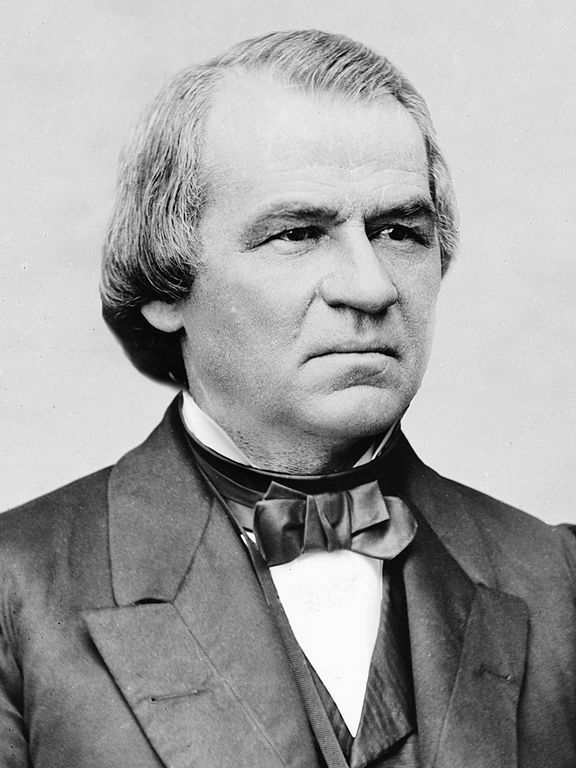 Andrew Johnson was a man with whom nearly every American can relate, from the poorest to the wealthiest. With unyielding determination, he rose from dire circumstances to the nation's most prestigious office without having attended a single day of school. Andrew Johnson was a Democrat; Abraham Lincoln was a Republican. For the first time in 1864, the National Union Party existed as a structured, nationwide party for the Lincoln and Johnson ticket. It was an attempt to unify Republicans and pro-war Democrats. During secession, Johnson was the only Southern Senator that refused to resign. 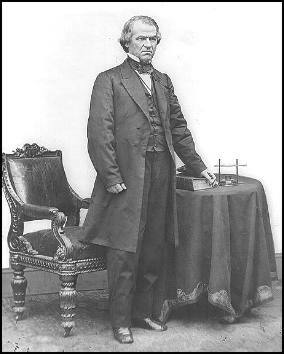 Andrew Johnson was born in Raleigh, North Carolina, on December 29, 1808, to Jacob and Mary ("Polly") Johnson. In 1811 his father saved some acquaintances from drowning in a river, but the effort weakened him irrevocably. He died in January 1812, when Andrew was three years old. Jacob Johnson had been a respected man, but one of meager means. With his death, his wife and two sons were left destitute. Polly Johnson apprenticed her sons, William and Andrew, to a local tailor. They ran away in 1824 and there was $10.00 reward posted for their return. In 1826 Andrew arrived in Greeneville, Tennessee, and opened a tailor shop and participated in debates at the local academy. Andrew married in 1827; Mordecai Lincoln, a relative of Abraham Lincoln's, performed the marriage ceremony for Andrew Johnson and Eliza McCardle. He was a capable tailor, and his flourishing shop became a gathering place for political discussion and debate. By 1829, Johnson was elected alderman of the town of Greeneville. He had embarked on his political career and would hold nearly every elective office between alderman and president. Entering politics, he became an adept stump speaker, championing the common man and vilifying the plantation aristocracy. As a Member of the House of Representatives and the Senate in the 1840s and 1850s, he advocated a homestead bill (see Homestead Act) to provide a free farm for the poor man. 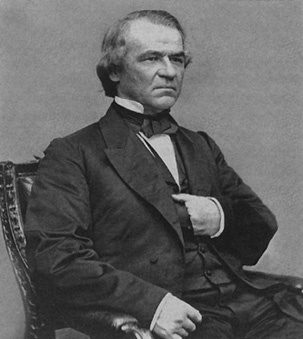 Andrew Johnson was injured in a train wreck in 1857. Consequently, his right elbow was virtually immobile and he often used a signature stamp for documents. During the secession crisis, Johnson remained in the United States Senate even when Tennessee seceded, which made him a hero in the North and a traitor in the eyes of most Southerners. In 1862, President Lincoln appointed him Military Governor of Tennessee, and Johnson used the state as a laboratory for reconstruction. In 1864 the Republicans, contending that their National Union Party was for all loyal men, nominated Johnson, a Southerner and a Democrat, for Vice President. The Radicals' first step was to refuse to seat any Senator or Representative from the old Confederacy. Next, they passed measures dealing with the former slaves. Johnson vetoed the legislation. The Radicals mustered enough votes in Congress to pass legislation over his veto--the first time that Congress had overridden a President on an important bill. They passed the Civil Rights Act of 1866, which established Negroes as American citizens and forbade discrimination against them. A few months later, Congress submitted to the states the Fourteenth Amendment, which specified that no state should "deprive any person of life, liberty, or property, without due process of law." All the former Confederate States, except Tennessee, refused to ratify the amendment; furthermore, there were two bloody race riots in the South. Speaking in the Mid-West, Johnson faced hostile audiences. The Radical Republicans won an overwhelming victory in Congressional elections that fall. In 1867, during Andrew Johnson's administration, Alaska was purchased from Russia for $7,200,000. Secretary of State William Seward was instrumental in the purchase. People who thought the investment a bad idea called the purchase "Seward's Folly." In 1875, Tennessee returned Johnson to the Senate. He died a few months later and was buried in Greeneville, Tennessee, with the Constitution resting under his head and with his body wrapped in the American flag. A constant champion of the common man and defender of the Constitution, Johnson had faced opposition and impeachment; he is remembered as the "Constitutional President." George S. McGovern—a Midwesterner, former U.S. senator, presidential candidate, veteran, and historian by training—offers his unique insight into our sixteenth president. He shows how Lincoln sometimes went astray, particularly in his restrictions on civil liberties, but also how he adjusted his sights and transformed the Civil War from a political dispute to a moral crusade. McGovern’s account reminds us why we hold Lincoln in such esteem and why he remains the standard by which all of his successors are measured. George S. McGovern represented South Dakota in the United States Senate from 1963 to 1981 and was the Democratic nominee for president in 1972. He was a decorated bomber pilot in World War II, after which he earned his Ph.D. in American history and government at Northwestern University. A recipient of the Presidential Medal of Freedom, he lives in Mitchell, South Dakota. Abraham Lincoln, who came into the presidency in the country’s greatest hour of need, towers above the others who have held the office of president—the icon of greatness, the pillar of strength whose words bound up the nation’s wounds. His vision saw the United States through the Civil War. His presidency is the hinge on which American history pivots, the time when the young republic collapsed of its own contradictions and a new birth of freedom, sanctified by blood, created the United States we know today. His story has been told many times, but never by a man who himself sought the office of president and contemplated the awesome responsibilities that come with it. George S. McGovern—a Midwesterner, former U.S. senator, presidential candidate, veteran, and historian by training—offers his unique insight into our sixteenth president. He shows how Lincoln sometimes went astray, particularly in his restrictions on civil liberties, but also how he adjusted his sights and transformed the Civil War from a political dispute to a moral crusade. McGovern’s account reminds us why we hold Lincoln in such esteem and why he remains the standard by which all of his successors are measured. "The greatness and imperfections of America's 16th president, captured by a former Democratic nominee for the White House. With considerable skill and insight, McGovern crafts a biography snappy, clear and comprehensive enough to please general readers, students and scholars alike. In eight short chapters, six of which deal with Lincoln's presidency, he nails the essential strengths, flaws, failures and achievements of America's most revered leader. "—Kirkus Reviews. "McGovern’s Lincoln is a finely wrought gem. In this small volume McGovern captures Lincoln’s character and leadership strengths better than many weighty tomes. It is a worthy addition to the brilliant American Presidents Series. "—Doris Kearns Goodwin. "If you like your biographies very short and sweet with a dash of corrective moralism, you might try George McGovern's Abraham Lincoln, a well-timed entry in Times Books' presidents series, written by the former White House candidate. "—David Waldstreicher, The Boston Globe. "Lincoln is one of the few presidents to be claimed by both liberals and conservatives. This volume by the former Democratic presidential candidate (in the American President Series from Times Books, edited by Arthur M. Schlesinger Jr. and Sean Willentz) examines Lincoln's record from a liberal point of view, particularly his early and apparent contradictory views on slavery—his platform made clear that his purpose was to contain slavery in the Southern states, not to abolish it. An example: In our 16th president, writes McGovern, 'We see the decency of popular government. Its role, then as now, was, as Lincoln wrote "to elevate the condition of men . . . to afford all an unfettered start in the race of life" . . . To him, democracy was an experiment that the world had not seen before.' Simply put, McGovern makes a convincing case that America's first Republican president was really our first democratic president. "—Allen Barra, The Star-Ledger (Newark). "The greatness and imperfections of America's 16th president, captured by a former Democratic nominee for the White House. With considerable skill and insight, McGovern crafts a biography snappy, clear and comprehensive enough to please general readers, students and scholars alike. In eight short chapters, six of which deal with Lincoln's presidency, he nails the essential strengths, flaws, failures and achievements of America's most revered leader. Born in a Kentucky log cabin, Lincoln was a melancholic who suffered more than his fair share of misfortune. According to McGovern, he nevertheless earned success through his ceaseless hard work, powerful intellect and incomparable abilities as a speechwriter. Lincoln began his political career as a member of the Whig Party. After serving in the Illinois state legislature, he won election to the U.S. Congress in 1846, but lost support by challenging President James Polk on the origins of the Mexican War and lasted only one term. The 1854 Kansas-Nebraska Act, sponsored by Democratic Senator Stephen Douglas, reinvigorated Lincoln's political ambitions. While he believed the Constitution did not allow for abolition in the South, he staunchly opposed the westward expansion of slavery. With the Whig Party split, he joined the new Republican Party in 1856 and ran against Douglas for a Senate seat in 1858. Although he lost this race, Lincoln gained national prominence as a result of his famous debates with Douglas. Two years later, he won the 1860 presidential election, a victory that angered the South and brought about secession and war. What was he like as a wartime president? In three core chapters, McGovern astutely assesses Lincoln's emergence as a commander in chief committed to 'total war.' The author does not shy away from criticizing his subject, particularly for suspending habeas corpus and censoring the press. Still McGovern's overall depiction is one of a complex, tolerant and extraordinary man who simultaneously preserved the Union and transformed the nation. Compact and commanding. "—Kirkus Reviews. "Former U.S. senator McGovern—who is also a Ph.D. historian—knows something about presidential leadership and the potential and actual abuses of power that come especially during wartime. In this compact but convincing portrait, he assesses Lincoln's greatness in terms of his ability to use his humble origins, empathy, keen sense of justice, uncommon skill in seeing the essence of an issue, faith in American democracy, gifts of language, and personal self-confidence—all to become a masterly lawyer, a party leader, commander in chief, and a heroic figure with both the vision and the practicality to realize his purposes . . . Given his own politics. About the Author: George S. McGovern represented South Dakota in the United States Senate from 1963 to 1981 and was the Democratic nominee for president in 1972. He was a decorated bomber pilot in World War II, after which he earned his Ph.D. in American history and government at Northwestern University. A recipient of the Presidential Medal of Freedom, he lives in Mitchell, South Dakota. Bibliography: The White House; Andrew Johnson National Historic Site; National Park Service; Library of Congress; American National Biography; Dictionary of American Biography; Trefousse, Hans L. Andrew Johnson: A Biography. New York: W.W. Norton & Co., 1989; Johnson, Andrew. The Papers of Andrew Johnson. Edited by LeRoy P. Graf, Ralph W. Haskins, and Paul H. Bergeron. 11 vols. to date. Knoxville: University of Tennessee Press, 1967; National Archives; senate.gov; bioguide.congress.gov.